1 : Pump your tyres – Every cyclist should have a track pump and should use it once a week to check the pressure in their tyres . The minimum pressure for a clincher tyre is 6 Bar or 85 psi whilst the maximum is 8 Bar or 120 psi . On very rough surfaces a lower pressure will have a cushioning effect but the trade-off is a slightly higher chance of a pinch flat ( Last year in the Paris Roubaix sportif Sean Kelly told us to ride 6.5 Bar in the back and 6 Bar on front – we had just one puncture between all of us for the day ). On very smooth surfaces a higher pressure will roll better and faster . Heavier riders should have slightly more pressure . In winter or in wet weather the pressure should be reduced slightly to give a little more grip . In general 7 Bar or 100 psi is a good guide if you are unsure . 2 : Watch the road – A pothole , a stone , broken glass or piece of metal . All of these can be avoided 90% of the time if you are looking out for them . If you are in a group it is very important to point them out to the riders behind you . A pothole or a stone will often cause a pinch flat which will go down immediately whilst a piece of glass or metal may take a while to work its way into the tube . 3 : Use good tyres – It is irresponsible to go out with a group of cyclists with poor tyres . I have seen guys heading out for 5 hour group training spins with the canvas showing through the tyre . I have changed tyres on the Sean Kelly Tour every year with the canvas showing . Very often the response given is that ‘I was trying to get the last bit out of them’ . In the first case there is nothing worse than having the whole group being forced to stop or ride up and down the road while waiting for someone to change a tube that will sure as anything be flat again later in the spin . In the second case , imagine training all year for an event or a race and wasting it all by using tyres that are not fit for purpose . There is also the safety aspect . It is unfair on your fellow cyclists to ride in a group with poor tyres that have an increased chance of slipping on a wet corner . 4 : Check your tyres : Once a week I go around my tyres with a scribe ( a very small screwdriver or a heavy pin would work too ) . I check for any piece of glass or flint and remove it . Then I fill the small hole left behind with super glue . It always amazes me how many guys racing don’t bother to do this . I don’t subscribe to the view that any cheap tyres will do for winter training . I want good tyres with good grip that I can trust , especially if I am going to be doing big miles on bad roads . Usually the price difference between a cheap tyre and a good one is the price of 2 tubes . This saving is cancelled out after 2 punctures . A crash on wet roads may cost a whole lot more . Tyres can be a personal thing . Some will swear by the gripping power of slick tyres like the Michelin Pro race 3 or the Schwalbe Ultremo R whilst others want a bit of thread like the Vittoria Open Corsa or the Vredestein Fortezza . The most popular tyre we sell in the shop is the Continental GP4000S in black . The black tyres are grippier as there is no dye used to add colour . The Vittoria Diamante or Rubinio pro are slightly cheaper and are good all round tyres too . For very bad roads in poor conditions the Schwalbe Marathon or Specialized Armadillo are a good choice as are the Continental Gatorskins . Good quality rim tape is also a must although the chances of a protruding spoke nicking the tube are a lot less with the factory built wheels that are so popular nowadays . The Mavic Open Pro style rim should be checked if persistent puncturing is occurring without ant other obvious causes . Tubeless tyres have a reduced chance of puncturing as do tubulars , but if you stick to all of the above you should not have too many problems . Here is a quick way to wash your bike after every spin . Everyone will have their own method but I have managed to do this in under 5 minutes and leave my bike looking like new . The amount of salt and grit on the roads at present makes this essential . Regular washing means no build up of gunk on the chain and cassette or wheels . This makes washing so much easier . I use Fenwicks foaming degreaser . Other degreasers are good too but I like how it pushes out the dirt as it foams up . I also use fenwicks fs-10 bike wash spray . This is very similar to products like muc-off , pirahna or finish line bike wash . I also use shimano chain and cable lube or finish line ceramic wet lube . I’m not a big fan of the dry teflon type lube but many people do use them in summer . We carry out all manner of repairs in our state of the art workshop . We believe that the best bikes deserve the best tools and use Park tools for every manner of job . Please feel free to contact us by phone or email and get your bike booked in for any maintenance required (0526121146). We aim to have a quick turnaround time on your bike, and this booking in system helps us to make sure you're not without your wheels for too long. 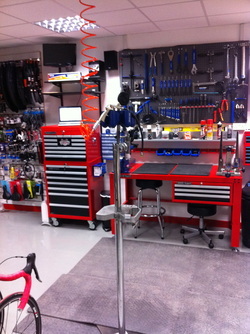 Our mechanics are Cytech accredited - we believe that your bike deserves the best.